SKATER: The “Calvinistic piety of Linlithgow” was said to be shocked when a Norweigan figure skater was spotted on the frozen surface of Linlithgow Loch. The Gazette columnist said the “hardy Norseman” gave a performance that nobody had ever witnessed taking place in Linlithgow before. ENTERTAINMENT: Inmates of the Linlithgow poorhouse were treated to a performance by St Michael’s RC Dramatic Society. The group performed a sketch called ‘Handy Andy’. Afterwards, a dance took place with music supplied by Linlithgow Orpheus String Band. SHIPMASTER’S CRIME: Martin Greve, a Russian shipmaster aboard the Ernest David, was charged at the Burgh court with the theft of a bronze vase from the Douglas Hotel. Greve was given a choice between a £1 fine or 21 days imprisonment. FREEZE: Temperatures in the Burgh plummeted to as low as minus 24 degrees, with “almost every second household” waking up to burst pipes. The thaw in temperatures meant plumbers were kept busy with complications such as flooded floors and faults in hot water provision. SOLD: An EUF manse on Manse Road, Linlithgow, was sold to a Falkirk gentleman for £920. The property, which had recently been vacated by the military, was owned by the Star and Garter and consisted of six rooms, a kitchen, a garden and offices. MOURNING: Bo’ness was saddened by the death of a promiment community activist. Annie Murray, who had taught at Carriden Public School died followed an operation in Helensburgh. BURGHMUIR: West Lothian District Council was accused of stalling plans for a four-way junction at Burghmuir. Regional councillor Bill Stuart wanted to see the land used for an industrial estate. 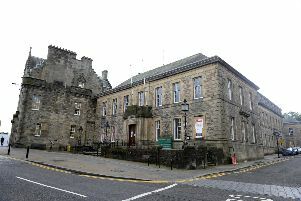 The district council branded his comments as “outrageous”. POVERTY SURVEY: Parts of Linlithgow were deemed to be “at risk” of poverty and were included in a survey into deprived areas in the Lothians. GALA DRAMA: A swimming gala at Bo’ness Recreation Centre almost ended in tragedy as two 10-year-old Cub Scouts got into difficulty during a race. Parents had to dive into the pool fully clothed to affect a rescue. Scout leaders apologised for not providing enough lifeguards. CAMPAIGN: A Save the High Street campaign was launched in Linlithgow in opposition to plans for a retail park to be built at Linlithgow Bridge. Co-ordinated by High Street traders, campaigners claimed that independent retailers in Linlithgow would be forced to close down and that Falkirk Road would not cope with the additional traffic. ABBATOIR: Linlithgow’s abbatoir on Braehead Road went up for sale after operating for nearly 100 years. The building was earmarked for residential development by Edinburgh firm GVA, who applied for planning permission to convert it into 62 flats. THEFT: Two males were wanted in connection with the theft of camera equipment from the Marie Curie shop in North Street, Bo’ness.